After our morning food tour, it was more or less an afternoon on your own kind of day. Three of us decided that we would take the Hyatt shuttle to the small town of Hoi An which is located approximately 20 km from the hotel. Normally the price would be a few dollars but our Hyatt status meant that we did not have to pay. Departure and return times are clearly posted by the bellman station. 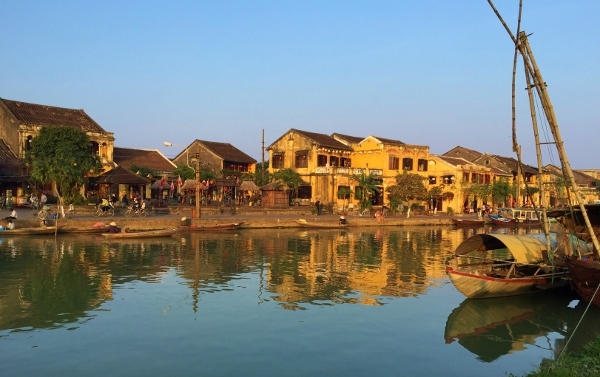 Hoi An was once a very vibrant trading port serving the mid southern region of Vietnam. The town is located in Viet Nam’s central Quang Nam Province, on the north bank near the mouth of the Thu Bon River. 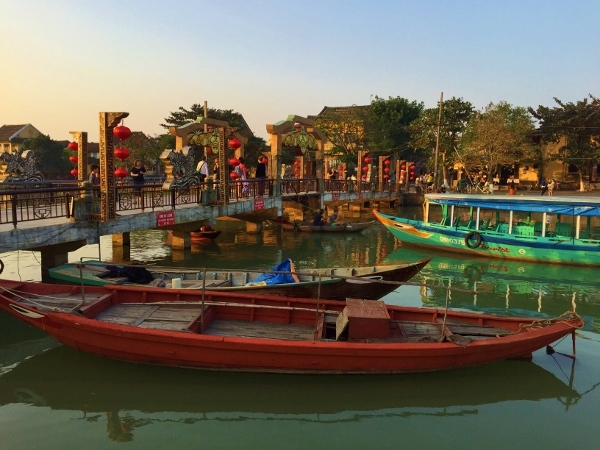 Hoi An is still a busy area only now, instead of ships, one of the primary trades is tourism. 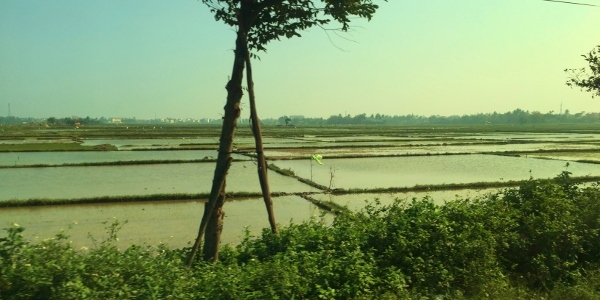 A short ride down the four lane highway found us turning off into the countryside of rural Vietnam onto a bumpy little road wedged between rice paddies. We were dropped off at the bus station and began our exploration of the ‘Ancient Town’ area of Hoi An. 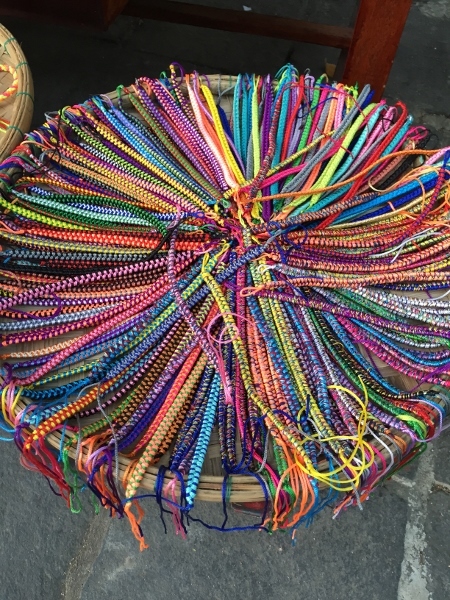 Fortunately, our first stop was one of the many stalls along the street which sell clothes, scarves, and other items made from Vietnamese cloth. I found a few things to my liking and my friend stocked up on scarves for presents upon her return home. We had one more stop before setting out to explore the City… and that was for a foot massage. 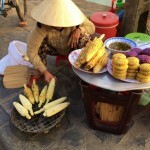 We were directed to Ba Trieu Street and discovered an entire street of boutique hotels and spas. 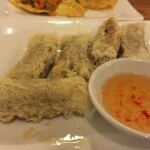 We happened to choose Su Bi at 93 Ba Trieu Street and were quite satisfied with our treatment. With shopping and feet now out of the way, we headed out to explore Hoi An Ancient Town. 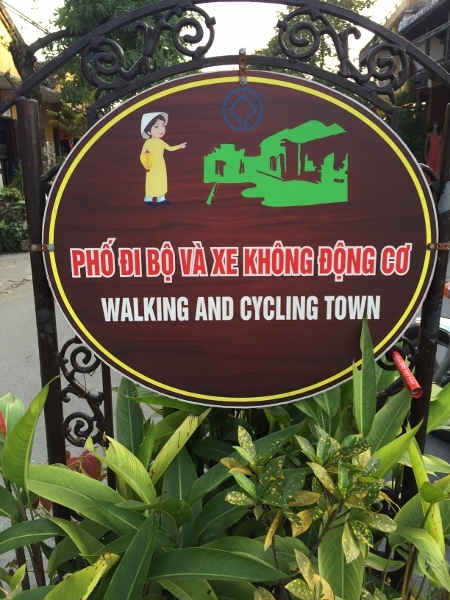 The pedestrian area of Hoi An covers about 2-square-kilometers of historical buildings and somewhat of a maze of tiny streets and alleys. I almost felt as though I had been transported back centuries. 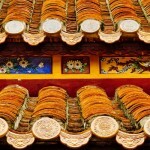 Golden French style buildings and pagodas topped with tile roofs called am and duong (Yin and Yang) with traditional roofs which are made up of thousands of brick-coloured am and duong [Yin and Yang] roof tiles. They are constructed of alternating rows of concave and convex tiles which are fit together quite ingeniously and work quite well in draining rain from the roof. Even though most of the historic buildings have now been repurposed into restaurants and tourist shops, they have been carefully preserved and still manage to retain their original character. A newly instituted ticket is required for your stroll through Hoi An in order to visit some of the historic sites. It used to be that the ticket was because of the sites only, but now appears that it is meant to be purchased before even walking through the pedestrian area. Each ticket is valid for 10 days and costs 120,000 VND (~$6.00) for foreign tourists or 80,000 VND for domestic visitors. The ticket covers entrance to six points of interest, entrance to the old town and street entertainment (folk dancing, singing, traditional games).Another friend was leaving as we arrived who gave us his ticket- we just showed this at the entrance and were waved through. As it was late in the afternoon, sites were closing, and there was no folk dancing or singing, we did not purchase additional tickets. 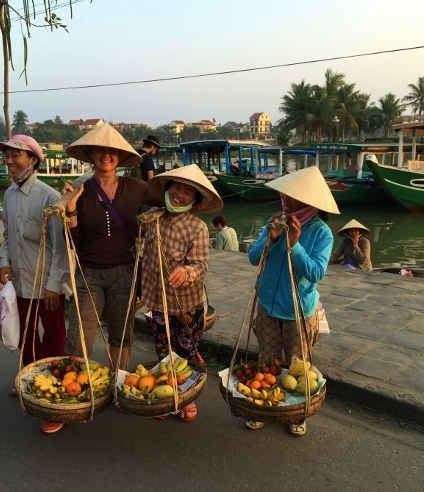 We strolled along the Thu Bồn River which was bustling with conical hatted ladies making a living selling fruits, tourist tchotchke, boat rides, lanterns and just about everything else you can imagine – even on the spot cooking classes! As we stopped to take pictures of the ladies selling fruit, we were compelled to stop – try on one of the bamboo hats and have our picture taken. I really believe the women have as much fun being in the picture as having you stop. Of course, nothing is without a price in Vietnam and the photo op ended up costing us about 50,000 Dong (~$2.50). In all faireness, we did get a bag of fruit to go along with that! 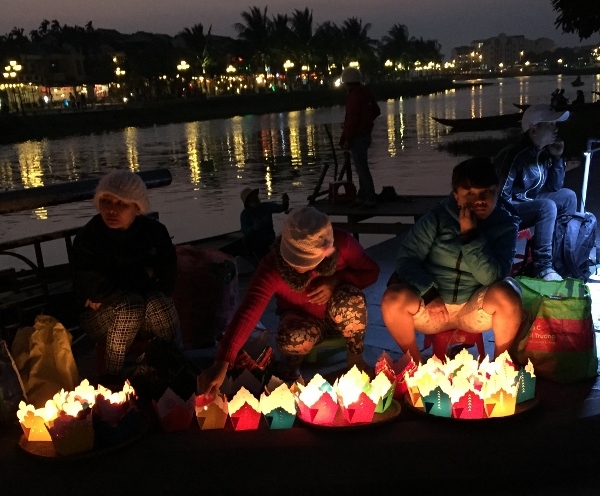 That lanterns play an important role in the life of the people of Hoi An would be an understatement. 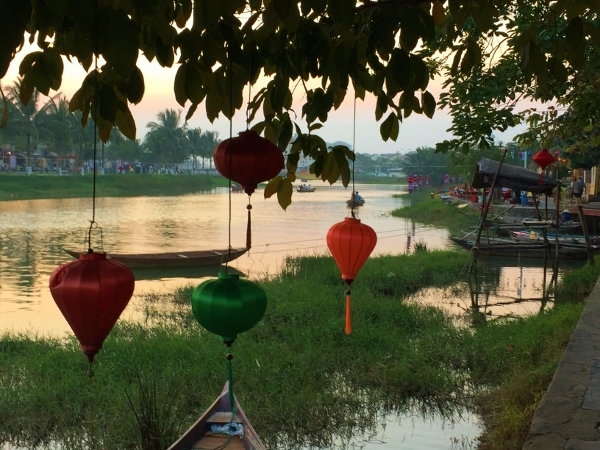 There are lantern shops everywhere – hanging from trees, storefronts and the bridges. They are absolutely stunning. As the sun went down, the lanterns were lit and we wandered through the night market across the bridge. 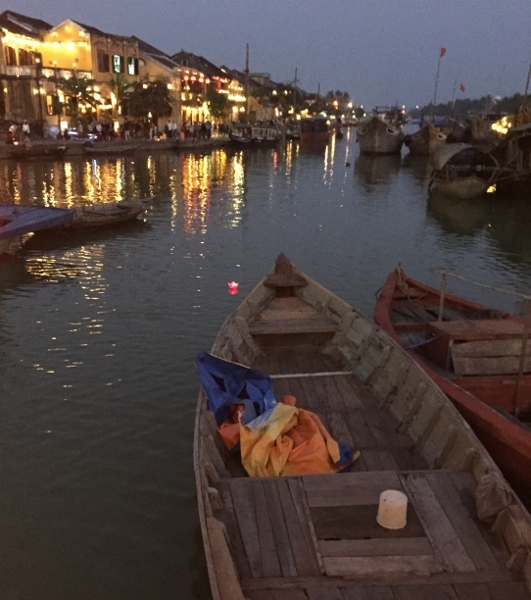 Before heading back to find something to eat, we bought one of the lotus flower-shaped floating lanterns and set it to sail on the river to bring us luck. 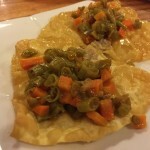 We finished the evening by eating at a small restaurant, Trip Ngyuen located at 736 Hai Bà Trưng Street. Convenient to our way out of the Ancient Town, we were not disappointed. 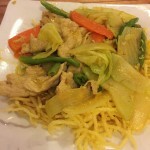 The staff were smiling and attentive and the menu was reasonably priced. With our short time in Hoi An at an end, we made our way to the main street. There was no problem catching a cab to take us back to the Hyatt. The cost of the cab was around 120,000 Dong. 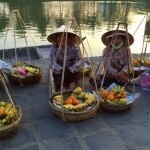 I absolutely loved visiting Hoi An and believe I would have enjoyed a longer time there than on our tour of Hue. There are so many sights (Lonely Planet) to see in the area that we just did not have time for. Here again, another reason to revisit Vietnam. I’d like to share this video with you. Created by Rob Whitworth – an Asian-based British photographer – it is a timelapse journey through a day in Hoi An. 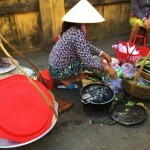 As Rob says “Hoi An is a hive of activity.” – and you can certainly see this in his video. I came across this on the site Vietnam Smile. 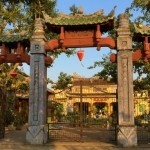 5 Comments on "Hoi An – Ancient Town – UNESCO World Heritage Site"
Looks great. I wish I could have stayed a few more hours to enjoy Hoi An with you guys. 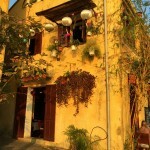 I just wish we had had more time to spend in Hoi An as well – one more day would have been great! Hey there….I’m loving all your postings on this trip! Curious….did you go through a tour company for your arrangements? My partner and I are considering a trip to Asia next year and he won’t go unless it’s an organized package, he’s afraid of the language barrier. Any suggestions would be helpful! Hi Tony – all of the ‘arrangements’ were pretty much made by the individual people who met in Da Nang. The tour to Hue (story to come) was with Da Nang Tours… and of course, Da Nang Food tours was an arranged tour. Hoi An was on our own. Thank you! I know I could handle it on my own but I need to get a tour company or I’ll end up going alone.